This silicone bracelet is debossed and says, "AWARENESS" on it. 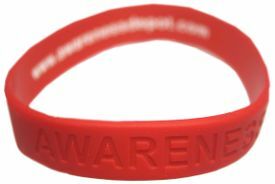 This red awareness silicone bracelet can be used to show your support for many causes, such as aids awareness or heart disease awareness. Standard 8" adult size. For orders over 100, call for special prices. 100 % lead free. Debossed means that it is similar to being engraved. Long lasting. High quality 100% Silicone rubber. Measures 8" around for Adult size. Make sure to see our full selection of AIDS Awareness products for more great ideas and gifts.